It is almost time for the wild blackberries and raspberries to bloom where I live. The plants are still tender; their thorny stalks are hardening. There have been wild berries since Creation, although the Fall (of man) due to sin yielded some changes that made growing, tending, and harvesting fruit a lot more tedious. The fruit you see in the image is delicious, tart, and can make jam, jellies, or a simple snack, but what does it take to get it? It takes time. It is an arduous process of growth among dozens of factors that work against the plants. 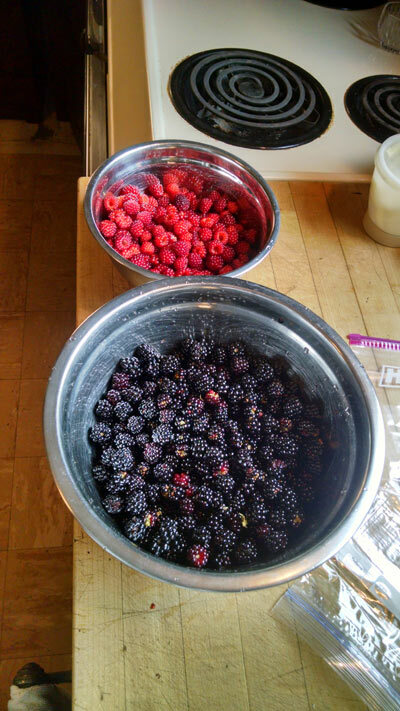 Eventually, however, the fraction of berries begin to ripen after a couple months. That is when the daring picker enters the thorny patches to try to get the best fruit. When you can see the fruit and want to get it, its typically hot and humid. You have to want the fruit to pay the price to get it. The whole process is a reminder to me that it takes time and effort for the Spirit of Christ to produce fruit in my life. If we are willing and we want to be fruitful in our relationship to Jesus Christ, His Spirit will take us through a process. At times it gets thorny, hot, and hard, but obedience to His ways, and good doses of humility and patience in the process, help keep us on course. That is how love is perfected. If you want to stay comfy and cool, organized to keep things in the order (you want), have head knowledge without much walking faith, there won’t be much fruit in the end. Then the fallen world or hurting brothers and sisters that need the fruit you could have produced will have to look elsewhere to get it. Are you willing to pay the price for fruit production in your life? Just remember that the process goes much deeper than the two neat bowls of fruit like you see in the picture. If you are willing to hang with God as He works in you, the resulting fruit will be good as well as fulfilling. Tagged Bible, fruit, love, parable.